1. 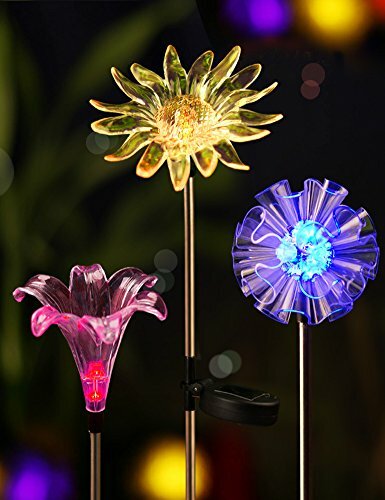 Solar LED garden lights with vivid figurines spice up your garden. 2. Decorate in any season in many places: garden, lawn, patio, yard, park, etc. 3. Bright LED bulbs of multiple alternating colors automatically illuminate at night. 1. Electricity is converted from solar power. 2. Lights turn on automatically at dusk. 3. No wiring required, fast and easy to install. 4. Operating time: 8 hours with a full charge of sun light. 2. Main Material: BPA free figurines + stainless steel pole stake. 3. Solar powered with solar panels. 4. Solar is a clean energy and does no harm to the environment. 1. One rechargeable AA Ni-MH Battery: 1.2V 200mAh. 2. Stake light stands approximately 2.5′ ft tall. 1. It will always be in the OFF position when you receive your order, you will need to switch it to the ON position during installation. 2. Make sure that the solar panel is facing the sun during installation. 1. Wipe the solar battery panel with a damp cloth periodically to optimize the charging by the sun, never use any chemicals.